PUEBLO, Colo. --- The South Dakota School of Mines football team had their hands full Saturday afternoon taking on the No. 16 CSU-Pueblo Thunderwolves Saturday afternoon during a Rocky Mountain Athletic Conference matchup in Pueblo, Colo. The Thunderwolves came into the game after knocking off the top ranked team in the country on top of it being CSUP's homecoming weekend. The Hardrockers fell to the T-Wolves, 41-14. CSUP went up 17-7 after the first quarter of play and then added two touchdowns in the second period and went into halftime with a 31-7 advantage. The home team added two touchdowns in the third quarter and then added a field goal in the final frame before SD Mines added a final touchdown down the stretch. The 'Rockers first score came on a seven-yard TD pass from Jake Sullivan to Carson Hunt. The successful drive spanned 75 yards on six plays. The fourth quarter score came at the 5:06 mark when Sullivan connected with Isaiah Manley on a one-yard TD strike. That drive was also 75 yards on 14 plays. Enis Sefa made good on both extra-point tries. SD Mines finished the game with 401 total yards of offense, collecting 256 yards through the air and 145 on the ground while the Thunderwolves accumulated 426 total yards --- 212 through the air and 214 on the ground. CSUP earned four rushing TD's and one through the air and were 6-6 when in the red zone. 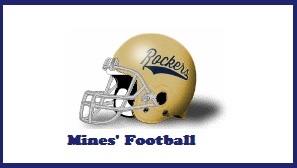 The Hardrockers scored both TD through the air and were 2-3 when in the red zone. With the two passing touchdowns, Sullivan now has 52 in his career as the all-time leader for SD Mines. He finished Saturday's game completing 22-37 for 230 yards. Connor Silveria led the ground attack, rushing for 96 yards of 12 attempts. Kevin Thompson finished with 35 rushing yard on 14 carries. Joe Luebbers led the wide receiving corp. with 111 receiving yards on seven catches while Manley had another nine-catch game for 77 yards and Quinton Starks had one catch for 27 yards. Defensively, Will Carroll led the Hardrockers with 10 total tackles (one for a loss), Justin Broekemeier recorded eight total tackles and Adrian Eastman, Cole Peterson, Andrew Karatepeyan and Michael Retland all posted seven total tackles. Retland was credited for a sack in the game for nine yards.